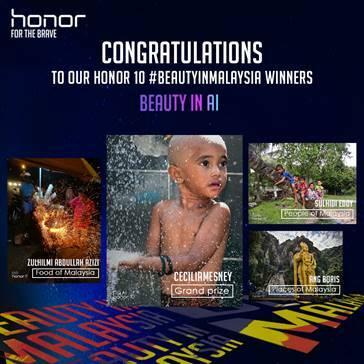 Barely a month later, the #BeautyinMalaysia photography contest launched by the leading mobile device e-brand, honor Malaysia, broke 1,000 contest entries, received from honor fans and users nationwide. The photo contest, which was open to all users of honor smartphones, ran from 1st to 26th July 2018, where the winner announcement was made via honor Malaysia’s official Facebook page on July 31, 2018. Entries were judged by a line-up of professional photographers and representatives from honor Malaysia based on the level of creativity and how each photo embodies the theme of “Beauty in Malaysia”. Grand prize winner, Ceciliamesney with her interpretation of “Beauty in Malaysia” took home a Vespa Primavera 150*, whereas three other winners, Ang Boris, Sulhidi Eddy and Zulhilmi Abdullah Azizi won an ‘AImazing’ honor 10 – a vibrant and powerful handset with 15 layers of ever-changing colour craftsmanship utilising the industry-first Semantic Image Segmentation for beauty in AI quality pictures, each. To showcase a compilation of the most creative entries from its users, honor Malaysia has taken the initiative to distribute a 20-page booklet featuring 20 of the best submissions which were judged by professional photographers and representatives from the smartphone brand, for public display at official honor stores across the nation. In addition to the grand prizes, each winner will also receive a copy of the booklet as a form of memorabilia and their winning entries featured on the hihonor website – honor’s official E-commerce platform and information portal, the honor theme app and honor Malaysia’s official social media platforms. These images will then be combined into a series of high definition, scenic wallpapers for all users of honor smartphones to view and utilise globally. “#BeautyinMalaysia was an initiative for us to engage with our fans and customers. A big ‘Thank You’ to every single one of you who have participated, and for sharing with us an array of the beautiful parts, people and places in Malaysia which we have never seen before. Do stay tuned to our official website and social media for more updates and contests such as this,” added Zhao. honor 10 is an industry-first handset with 15 layers of ever-changing colour craftsmanship utilizing the industry-first Semantic Image Segmentation for beauty in AI quality pictures. For more information on the “Beauty in Malaysia” contest and to know more about honor Malaysia, please visit https://www.facebook.com/HonorMY/ or http://www.hihonor.com/my.